With gemstone jewelry, you should generally avoid sudden temperature changes. If you have a very active lifestyle, you may want to refrain from wearing your gemstone rings and bracelets throughout the day. Some gemstones are very brittle, especially emeralds, whereas rubies have a hardness second to that of the diamond (which is 4-5 times harder). Just like diamonds and jewelry as a whole, avoid harsh chemicals and activities that may cause damage to your gemstones. 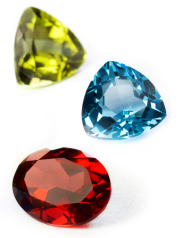 For color or clarity enhanced gemstones, ask a Jewelry Design Studio professional about caring for these stones. Cleaning and repair of your enhanced gemstone jewelry is different than normal gemstones and diamonds. For more information about each particular gemstone, read our gemstone guide and stop in to ask one of our professionals.